I am coming up short researching my own parts to make my swap work so I’m going this route: which parts will work for what I want. A) Truck oil pan: already have it, tapped for turbo oil return line. B) Truck intake manifold: already have it, one of the best OEM manifolds for horsepower and torque. C) Truck AC compressor (low passenger side mount): already have it, most effeceint from what I’ve read. B2 Fabriation (Holley-style set back mounts) don’t clear truck oil pan nor truck AC compressor. Score: B only. 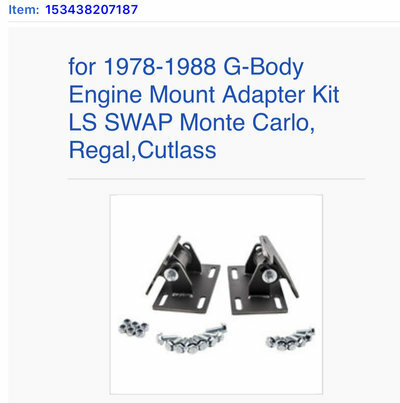 eBay mounts (pictured below), seller states will clear truck oil pan. Score: B possible A and C.
Spohn also states their mounts clear truck oil pan, not sure about other issues (AC, manifold, etc). Score: B only, possible A and C.
Holley mounts will require Holley pan ($400) but likely fit truck intake, but not truck AC compressor. Score: None. So after all that, does any one know of a set of parts that will get me my needs? I’m running around in circles. If I have to settle for two out of three verified, it will be A and B. Please help. Holley mounts with pan fit all truck accessories except AC. But for a measly sum you can get the Holley high mount AC setup. $$$ but it works and is proven. Truck AC compressor or Olds AC compressor? I don't know for sure. Might be the Olds R4 compressor. I'd have to look it it. Why not use the gm muscle car oil pan? For me at $225 it is well worth the peace of mind....even on a stock ride height car. On the topic of AC, there was a guy on the forum here that bought UMI frame pads and 4th gen camaro block mounts, he was able to fit the stock truck AC pump in the stock location, maybe it was a Rainier/TBSS pump? I wish I could find the thread, it was the best fit of any swap I have seen, it just worked and made sense. The musclecar pan is the most ingenious marketing scheme GM performance has going for it. Rebadge a H3 or colorado 5.3 oil pan for hot rod use at an attractive price but offer almost zero benefit. I have yet to see an application where a truck pan fit that a colorado/muscle car pan also fit and made any improvement. Its .5" shorter in the back but almost .5" thicker in the front, which is equally as bad for most engine mount kits. Aha! Here we go, I personally know this car and it works great. If I were to do my swap again i would copy that build list. This is EXACTLY what I am talking about Thank you!! I talked to their Customer Support and thought that I got confirmation the mounts will clean the crossmember but now as I reread the email, it's not as clear as I had hoped. I would budget for a pan. I used the CHevy hot rod pan and it still hung an inch to inch and a half below the crossmember. Truck pan was roughly 4 below. PSI has a nice plug and play harness for factory computer. I am thinking a Northstar for my Olds, and have been doing some digging on Megasquirt. I think they may have the hot ticket for a solid DIYer on power train management if you do not have the stocker and are on a budget. They are offering new wiring harness now as well, though I think you will need the connectors from the doner motor.